I am always on the lookout for nice resources about the more esoteric side of wealth creation so I can use them and test them myself and then share them with you – my readers, friends, followers and clients. Here are a couple I discovered recently. I hope you enjoy them. If these are too woo woo for you, keep reading. Something more “normal” is bound to come along shortly although normal is not our thang round here, I’ve gotta be honest with you. But down to earth does also get sprinkled into the mix most weeks. 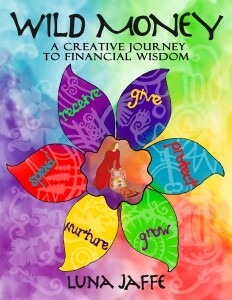 Love Letters to Money by Luna Jaffe and her students and clients. There is much about money to enjoy at Luna’s colourful Wild Money blog and her website, where creativity and money meet (lovely strapline, wish I’d thought of that one). Keep an eye out also for her upcoming book Wild Money which she describes as “the world’s first beautiful book about money. In the first Love Letter to Money, Margie writes “Dear Money, I have taken you for granted, always assuming you’d be there whenever I needed. Even though you do your job, I toss you aside, offer little appreciation or value for how you’ve worked in my life. I snub you in spiritual arrogance and mystical manifestation.” Read more and share your own letter here. If you don’t want to share your own love letter to money with the whole of the world wide web, why not simply journal it, keeping it personal and update it as your loving relationship with money grows and abundance starts to roll in? Not comfortable with loving money? Drop me an email (or join the Money Making Magic Google Group) and I will coach you through that one (on Skype) for free or for a donation; your choice. 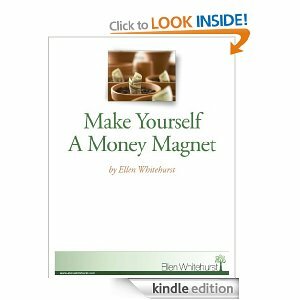 Next Ellen Whitehurst, author of Make This Your Lucky Day: Fun and Easy Feng Shui Secrets to Success, Romance, Health and Harmony but, more particularly, she has also written a little kindle book called Make Yourself a Money Magnet available at Amazon for £6.48. Ellen’s book is also available as a course sent to you over 27 consecutive days by DailyOm where you can choose to pay anything from $1 to $100 dollars for it. I LOVE that abundant business model which gives us the choice of what we want to pay for something. Check it out here. Today is my first day of 27 following Ellen’s tips and no doubt I may feel compelled to share my results as I go. I love the number 27 as it is the day of my birthday and in this month of April too as it happens so this seems magical to me in a “there are no coincidences” sort of way. I also studied Feng Shui, having lived and travelled extensively in Asia as a child and a younger woman, way back when I was looking for what I wanted to do next after accounting and before coaching. Ellen’s website is well worth a visit and you can find out more about her and her Shuistrology on Facebook. The 27 day course is available from DailyOm, a website I highly recommend as there’s so much on there of value which is available for free as well as stuff you might like to buy spending as little as one dollar. Thanks to Hilda Carroll for introducing me to Daily Om. Hilda’s Happiness Business also offers the antidote to stress as she teaches you online how to meditate. And finally if you are fascinated by Feng Shui, former Dragon’s Den star Rachel Elnaugh is also a big fan and Feng Shui principles inform her 2013 Lucky Prosperity Spiral which is still open to joiners from only £80 per month.